Once you try it, you won’t want to go back. Nest, Tado, Hive, Honeywell's Evohome. Smart heating is everywhere and some of them are very good. We check out Heat Genius. Heat Genius is a modular system that can be augmented to control your heating, hot water and even plug-in appliances/devices. Designed and built in the UK, Heat Genius can be attached to any boiler with a standard backplate.The Heat Genius Hub is a white plastic box about the size of a house brick. It plugs straight into your broadband router. 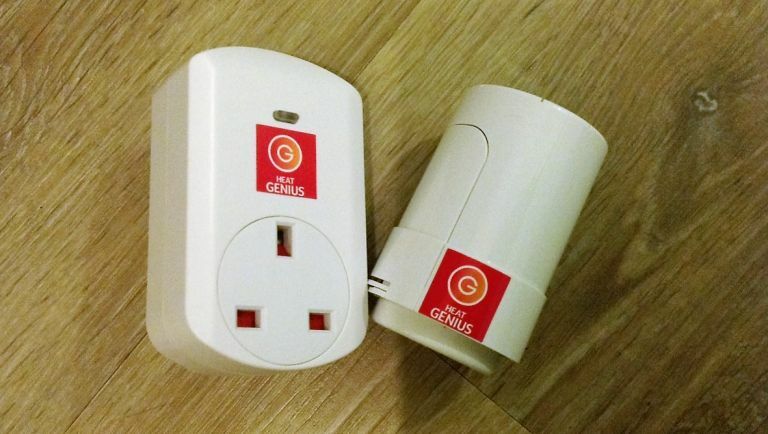 Heat Genius smart plugs can control lamps and appliances, while a TRV hooks up a radiator. They're easy to install, but they do cost. Wireless Thermostatic Radiator Valves (£60 each) control individual radiators while wireless PIR sensors (£35 each) track occupancy. With more PIR or temperature sensors, Heat Genius can also monitor room usage. Thebasic setup enables you to set a timed seven-day heating schedule via a sky-blue web app on the Heat Genius website or using the HG mobile app, which is available for iOS and Android devices.You thenspecify a default temperature for your house. Heat Genius starts to stand out from the clever-clogs heating crowd when you add 'zoned' and 'smart' heating - if you have wireless TRVs on your radiators these can be controlled individually. The system doesn't just control your heating. Using smart plugs it can control your lighting as well.The battery-powered room sensors monitor temperature and movement, reporting both back to the Heat Genius Hub and the app. In Footprint mode, the system learns about your movements so that it can predict when to switch your heating on and off.The built-in graphs enable you to see when a room was occupied, what the set temperature was and whether that was reached. Each room can have multiple devices, such as a PIR room sensor and a thermostatic radiator valve. With room sensors installed, you can see when a room is occupied (note the person icon in the Living Room). There were some niggles. Here the Living Room sensor isn't responding and the app is reporting 58 degrees in the Dining Room (it's not). In a traditional system, your heating is either on or off. Here, there is a wireless controller, boiler controller, plus radiator valves, IR room sensors and smart plugs. It's very useful to be able to controlcontrol your heating remotely and, with the intelligent Footprint mode and smart plug support, it's in smart home territory. As we've seen with Nest and Hive, that's where the game is currently at for these devices. I tested the system for six months and binned the TRVs; I actually now heat the whole house instead; it's just easier and I'm not sure I trust the technology yet.